One goal of Arts + Advocacy: Citizenship for All Adoptees was to place today’s problem of adoptee citizenship into a larger context. 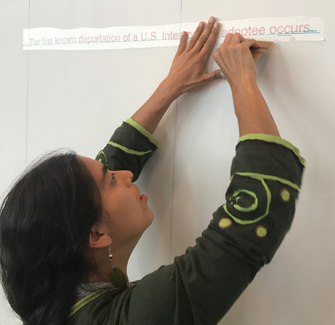 Through educational materials, speakers and exhibition spaces we illuminated the history of adoptee citizenship in the U.S. and how that links to the history of immigration and deportation in the U.S. This “big picture” storytelling helped attendees gain a fuller understanding of the issue — and why it’s urgent to address it now. The Sanctuary Print Shop included a floor-to-ceiling timeline covering three walls. This timeline, constructed by Sergio de la Torre and Chris Treggiari, showed key events in the history of U.S. immigration and deportation. 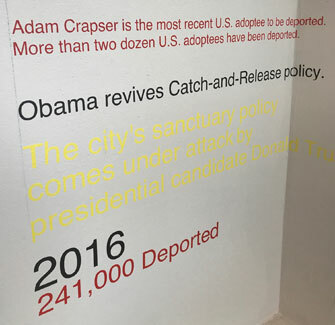 The Adoption Museum Project’s history team identified seven events in the history of intercountry adoptee citizenship and deportation. Sergio printed each event onto vinyl and then painstakingly cut each one by hand. Three internationally adopted people, including one without citizenship, placed the events on the wall. In those minutes, adoption became visible to the public. 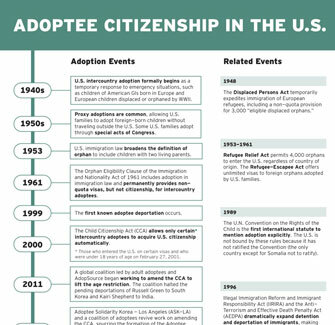 Working with a team of volunteer researchers and designers, we created a handout entitled “Adoptee Citizenship in the U.S.” Our goal was to design a one-page document that would make complex information easy to understand by anyone, whatever their knowledge of adoption. The front gives an overview of adoption-specific and related historical events. 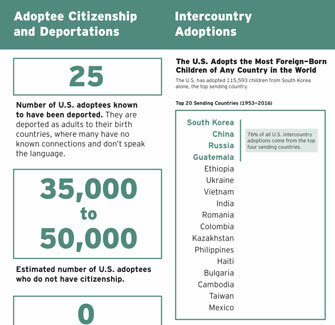 The back has key facts about international adoption and adoptee deportations. The handout is meant to be a free public resource. Please download the PDF for your own use and sharing.